Eastland-Fairfield Career & Technical Schools serves 16 school districts in Franklin, Fairfield, and Pickaway counties. It covers an area of 700 square miles, and is the seventh largest career and technical district geographically in the state. Students in 11th and 12th grade are eligible to attend. The District has two main campuses — Eastland Career Center in Groveport and Fairfield Career Center in Carroll, with satellite locations at five of its associate high schools: Gahanna Lincoln, Groveport Madison, New Albany, Pickerington North, and Reynoldsburg. schools and teachers make a difference. the 21st Century will reward workers who possess state-of-the-art technical and advanced academic skills. our district's value is measured, in part, by our constituent's perception. the characteristics of our environment are constantly changing. Further, we believe our curricula and instructional deliveries have to evolve in order to stay relevant. Hence, our institutional culture must be of calculated risk-taking and innovation. the progress of students must be measured, in -part, using standards developed by internal and external constituencies, as these guidelines. help determine "how good is good enough." the purpose of education in a free society is to facilitate the development of each student and that each student has both the right and responsibility to make choices and decisions that foster the betterment of self and society. 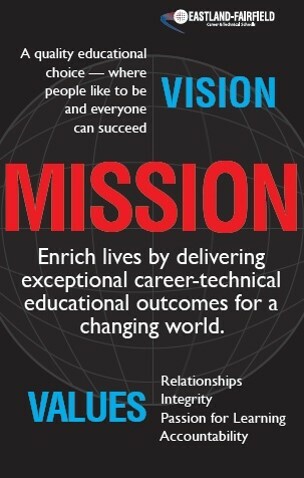 Eastland-Fairfield Career & Technical Schools strives to offer high-tech, in-demand programs in order to better position students for a successful future. The District offers nearly 40 high school programs designed for students in their junior and senior year. In addition to traditional career and technical programs, such as Auto Technology, Welding, and Cosmetology, Eastland-Fairfield offers many programs designed specifically for students who intend to continue their education at a college or university. Currently, more than 57% of Eastland-Fairfield students continue their education at the post-secondary level. Included in the Eastland-Fairfield district are nearly 2,500 adult education students who attend classes offered by the Adult Workforce Development Center and its Lancaster and Columbus satellite locations. Seven full-time programs and many part-time programs are offered for adults. Assisting the district in curriculum and equipment update assessments are hundreds of representatives from business and industry. Serving on advisory committees for the full-time adult and high school programs, these professionals play an integral part in keeping the curriculum current with industry standards. Preparing you for the career you want. The goal of the Adult Workforce Development Center at Eastland-Fairfield Career & Technical Schools is to provide you with the knowledge and skills you need for the career and future you want. Did you just graduate from high school? Maybe you’re returning to the workforce. Maybe you would like to completely change careers. Whatever your motivation, we can assist you in your job quest. We offer both Full-time and Part-time classes to fit your schedule. A counselor is available to assist students in our full-time programs with managing or overcoming barriers to school success, including obstacles related to educational and career goals, practical issues, and personal problems. To schedule an appointment, call (614) 836-4541 ext. 1534. Should you have concerns or questions regarding your career path, a certified counselor is on staff to provide personalized career counseling and assist you in your decision making process. To schedule an appointment, call (614) 836-4541 ext. 1534. The adult workforce staff will assist successful full-time course completers with resume development, employability skills and job search techniques and leads. Eastland-Fairfield Career & Technical Schools Adult Workforce Development (AWD) operated through the State of Ohio Department of Higher Education. AWD is accredited by The Council on Occupational Education. To view Accreditation, visit The Council on Occupational Education at http://www.council.org/. The school’s full-time career programs also receive separate national accreditation based on self-study, visit review and ongoing assessment processes. Students who complete most full-time programs are eligible to take national or state certification exams.